With New York Fries’ “Poutinerie” branded stores spreading across Canada, its trademark filing for its new logo is also proceeding along the way. Below is their trademark as filed with the Canadian Intellectual Property Office on the basis of proposed use in respect of “poutine” and “restaurant services”. I discovered “real” poutine when I first moved to Montreal.. before, “poutine” for me was just any old fries with grated cheddar cheese and gravy on top. I had no idea how godly delicious those lumpy-looking squeaky cheese curds could be (yes, they squeak when you chew on them if they are fresh and served at room temperature). 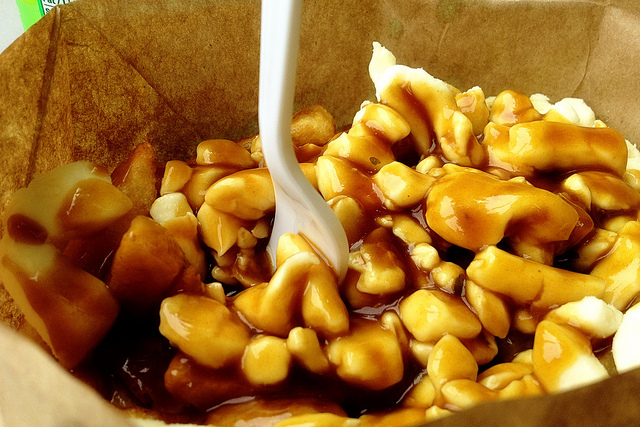 With competitors like Smoke’s Poutinerie also opening more locations across Ontario, is authentic Quebec-style poutine finally reaching the cheese curd-ignorant masses from coast-to-coast? Mmm.. butter chicken poutine. Er, maybe not quite. Legal Cut Pro Podcast Launched! RedFrame Law and related words, domain names and logos displayed on this website are trademarks or trade names and the property of RedFrame Law. RedFrame Law’s trademarks and trade names may not be used without express authorization.